Conditions:Valid only on items marked on the promotional page. Some exclusions apply. As in description 10% off Ebay.com. As usual need to change the address. For anyone who missed the recent ebay.co.uk deal. Beware 24h only. I managed to get it to work using an old ebay account I had that I registered and used whilst I lived in the States. Bought a house in the States but it still won't work for me. Doesn’t work. I used the same method that has previously worked. It looks like they have stopped it. Exactly, if you got a way to make it work, tell us how please. Doesn't work as previously. I moved myself to Rhode Island (some hardware store) in Warwick, changed localization on ebay mobile app. Try to pay with code on both...doesn't work. Try PAYDAY starts at 10am today 28/9 Another member posted it this morning. It's a random discount . Pick an item and refresh the browser a few times and you might get lucky . It was random on that one item too. I saw it and thought great I’ll have a look at something better then went back to original item. The discount had then gone but after pressing F5 around 6 times the discount came back on ???? I do sympathise with the OP: Ooh, discount. Excellent. Ok, maybe just for one retailer. Oh, may not on all items from that retailer. Erm, what other items? ... was it just for that one item? *silence from eBay* At 5% on seemingly very hard to spot items, it's like a really really stingy tombola, and there is no way the OP could have anticipated that! More Info	Say Hello to Fall with 20% off select purchases of $25 or more. I posted this last week, sorry. Will i be able to create Australian account with a UK mobile number? It only works with Australian made accounts. I've just created 5 new ones with my Irish landline (for the pin code) and it worked like a charm! OK I changed country and kept address line 1 / city / postcode the same but it’s still not working, same error, I even get email confirmation of the change of address to australia, any help would be appreciated! Would have been good if it was applicable to everything, shame it's selected sellers. Groupon is incorrect. I used that code a month ago. I have just tested it and eBay says it is expired. As for Groupon saying "Discount Verified" and "543 used today", I can only guess that 543 users have clicked on the link. That doesn't mean that it worked. I will check your pocket and see. I had one of these vouchers sitting in my account, didn't get an email notification about it even though i am supposed to, was expired by the time i saw it. Now i have one in a different account and it will expire on 2/9/18, still not email notification :/ . It looks like the tag that appears if you have Nectar points linked to your eBay account. But in that case the discount would be applied to anything you bought. Tell me about it! Looks like a proper official eBay voucher as it has the T&amp;Cs page that the link takes you to. Maybe someone accidentally pressed a button and launched it early? 20% off	20% off eBay.com until 4 July. Yes as it says on the original post. Selected stores. If you can find any UK-based sellers/stores that are in the participating list I posted just below the main deal post, please let us know (highfive) Yes, I've added it to the main deal post - just below it. If you mean the delivery of digital items such as software then it works fine. Although some sellers don't set up their Listings properly so they show postage for international shipping plus potential duty. Any chance you can report this as expired, I'm unable to expire it, and it finished yesterday. Unfortunately, this promotional offer is by invitation only..... Says this for me, anyone know how to get an invitation? I used my mrs 1p final value fee the other day &amp; she hardly uses eBay, I use eBay all the time &amp; the best deal I get is the £1 deal. This post is the epitome of this site since it was sold. No.. absolutely not.. they put up price by 30% so that they make 10% extra profits.. Now thats what I call business. Maybe put the price in the title just a thought. M&P have 10% off on Parts/Accessories ending 4th May in their Ebay store. Checkout code is P10MAY Also have 20% off clothing SPRING 20 on their own website as listed below. Congratulations, you can count! That's his fault, he assumed there was only one magic word. He was wrong. Thanks. No luck for me trying this code, seems only USA based sellers so not eBay wide. Lucky if it happens once a year on UK eBay. Aww rats! Right I'm adding "ebay" to the notifications thing on this site. I missed it! Pretty much useless unless you can find a UK based seller this applies to. This is selected items, not everything , which would mean your importing from Australia. It's for specific sellers, but foxy (original poster) is saying they used it on the UK site. How does that square? The seller he bought from was listing on eBay UK? Details foxy? Hell no, for selective seller only. What is the Promotion? This Coupon is a 10% discount valid from 6:00 AM PT April 3, 2018 until 8:00 AM PT on April 7, 2018. Discount applies to the purchase price (excluding shipping, handling, and taxes) of an eligible item(s) of $25 or more on eBay.com, cafr.ebay.ca and ebay.ca. Eligible items are items(s) purchased from the sellers listed below. The discount will be applied to eligible item(s) only and will be capped at a value of $50. Sellers for Coupon redemption: 1-perfumes 4wheelparts aabalat_fine_and_rare_wines acejewelry4ever adamswines adidas_official alwaysacceptingoffers americanlegacyfishing antonlinedeals apluschoice asavings backcountry baseballsoftballworld bid4invicta bidonrugs bigvalueinc bissell_homecare_inc botach bowl300300 brakemotive76 brillianteers buyautoparts buybeehive candcmoissanite carlfan carsteering certified-watch-store cheapgamestuff chicagowinebroker ckstamps collectionbijoux100 consumerelectronicscostsavers cork-wine-online cozyarray crocsoutlet cultwines dailysteals davidlawrencerarecoins ddsporto dell designerlivingus dirtdevil discountacparts djsboardshop drinkdispatch dukewine dymoda factory_outlet finajewelers fitnessfactoryoutlet fourwheeldrivehardware foxrox1 gailsinger gamesandcards.com gameusedguru88 gdriveblack gemstoneking golf44bob goodgram goodlibationswineshoppe goshortcut-online grandwineexchange grapehilltraders greatautoparts green.thumbs.galore gronkfitnessproducts gvineyards hocksports hollywoodmemorabilia hookedonwine hoover-outlet-store horselovers hottercooler hubcitysportsstore idonowidont ienjoyhome imperial123 jenns_bikes jewelry.com jewelry4less_atl jewelryunlimited786 jjbuckleywines jlhrick jockeystore joerackem justbats k2motor kastkingfishing knwine la_via lajollajewelry linda*s***stuff linen2go linenbathbeyond little_star_electronics llcoach23 longevitywines lornajaneactive_us luchaunderground luxurybazaar maisonduprixwines melandrose mikaelians-jewelry minormiracles mlgjewelry my-diamonds nashvilleshoewarehouse nationwide*furniture noblespirit oakgem okgogold overstock palacage pelletestate pennantdynasty plumeridgebottleshop pompeii3 primocaps purewatches qualidiam quimperettechan re_tech_deals recreation-deals reebonzus regencyrugs retailfashionoutlet retro2heritage rockwelltools rosewill_inc rsawineman rugdealz rugsandtiles saverightaway scmvwine4u sflmaven shippped shoesandfashions shop-invicta shophomenfashion shopitfashion silveroakfan silverspeck snowdealsnow softball_fans sophiejanejewels sportsmansoutfitters sportsmemorabilia ssgssg10 steelcitycollectibles1 steinersports stuhrling sunnydaze-decor superlight.diamonds teamexpress tech-rabbit teespring_inc tempur-pedic terravinoinc tgm_skateboards the_boss_gts theozarksource thewatchoutlet thewinebro timeworld timex tkwine toppersports travelerschoice trendlee triwico tshirthoarders turbochargerpros twobirchjewelers twoguyswineclub7 uhorse unwined vampirevineyards vergest23 victorioussales22 vividice voodublu walkintofashion watchandthings watchcounty123 westernpowers williamsoutdoors wilsonbrothersjewelry wilsonsleather wine-merchant-usa winedirectwines winemart wineonbroadway winespies winester wineworld1 woodburyoutfitters worxgt www.mrvalue.com www.powersellerusa.com xtremegems2010 yescomusa yianniswine zromaya2304 How to redeem your Coupon: Shop for eligible items from specific sellers as listed above. Pay for your item by 8:00 AM PT on April 7, 2018. Enter the Coupon code in the redemption code field: PTAKE10NOW Additional Coupon Terms &amp; Conditions: Coupon can be used once within a single transaction (or cart), while supplies last. Valid only for purchases from ebay.com, cafr.ebay.ca, and ebay.ca. Any unused difference between the discount amount, as shown on the Coupon, and the purchase price of an item(s) in a single transaction (or cart) will be forfeited. Coupon is subject to U.S laws, void where prohibited, not redeemable for cash, has no face value, and cannot be combined with any other Coupon, or when paying with PayPal Credit Easy Payments or Gift Cards. eBay may cancel, amend, or revoke the Coupon at any time. Don't be afraid, report it with a link to the existing deal and the mods will sort it out but they won't know if you just put a comment in a thread, They are the only ones that can delete a deal. Yeah, all the same, it says looks like that's the wrong code, try again. This is in stock and also a good price. HUKD baffles me sometimes. How you get 330 off Nectar Points?? This post has more detail about the categories involved thanks op. Posted 3 hours ago. But thanks for the effort. It's likely he was posting in a repost thread that has been removed. For some stupid reason when they do this, they merge the comments. Which then makes someone look foolish. Has happened to me a few times now. You just linked the very thread we're in. What's the odds eBay do this again for UK customers? It was roughly 3 months ago they did it last. if you know ..from US always get charged import charges..and still cheaper than UK. can you show me samsung galaxy S7 active for 135 in UK i will buy another one..
10% off	10% off everything in AO eBay store. Over £40 Spend! I'm not sure how this is proof? It's all in dollars, when I buy from the states it gives me the price in pounds too. Plus don't forget about import and customs charges. However if you log onto the US eBay and chose UK as location for goods then it might work. anyone tried buying UK stuff through eBay.com. can't remember if your commitment to buy after clicking "buy it now"
I'm sure I can find something on the American Legacy Fishing shop... Seriously, if I can find something that looks like good value... I'm in! I'm assuming you have to register even if you have an ebay account in the UK? Received an email from ebay with a coupon code with £10 OFF with £20 spent (minimum). The coupon code is valid till 26th January. Never ever, ever get these promo emails. :/ Only ever seem to get special priced selling fee ones! Haha 100 pound off for 50 pound spend. I definitely want this voucher. What was it? :/ think I need one too. upto 5000 bonus points are put back - so with a 10000 points/£50 spend you should still get 5000 points back. But are we sure the link on here leads to activation of the offer? Thank you SO much! (excited) I don't appear to have received this offer.... XD however it somehow bypassed me that you can USE nectar points on eBay! I had a lot,so have just cashed them in against something I wanted - that I was going to buy anyway! crap i clicked on the link so doubt i,ll get my points back , aw well lesson learned i suppose ! didnt realise it was only upto 5000 iv,e just used 10,000 but hope i get them back cos i havent before using this deal ! Which address did you use on your ebay Australia account? I used my UK PayPal to pay for my UK item shipped to a UK address, so I reckon if you signed up for a new eBay account on eBay Australia then you could use the code without issue. I think you need an ebay.au and aussie PayPal account to get it to work From the terms and conditions : The redemption code requires payment with an Australian PayPal account in order to take effect. Your eBay.com.au and PayPal accounts must be active at the time of redemption (not suspended nor made inactive by eBay or PayPal) and be registered under the same email address. Yeah got this on my account at the moment "use your voucher to save" and it links to no where, had it for a few days, even had it on a spare account. On one it's disappeared completely but on the other it's still there. Went through live chat, as above confirmed that there was no voucher tied to my account. I thought they might take pity and offer me one anyway but nope. Isn't this suppose to finish on the 15th? If it doesn't work, contact customer service, apparently others users are also having issues with this coupon which they said will be resolved in 24 hours. Five percent quidco cashback today too!!!!!!! I have no idea why people by a dyson !!!!!! Worst hoover i have ever used i dont want to make a multi millionaire even more rich either !!! I have an email saying I have paid the full price from PayPal but nothing out of my account as yet. Mine has been linked for some time now (back from when eBay and PayPal were still the same owners). The voucher requires payment through PayPal, if that helps clarify. Do You have linked Your paypal account to ebay? Sorry about the link not seeming to work, I tried to link to the landing page for "My eBay". When I click the link myself it takes me to a login page and then the My eBay page. You could try logging into your account and just clicking "My eBay" at the top right. If you have the voucher on your account it will say at the top under the header "Vouchers".Edit: Image showing the voucher. I just used it successfully on the new Mario Switch game. Ensure you have a PayPal account set up and check that the e-mail address eBay used to send you the voucher is one of the e-mail addresses linked to your PayPal account. If not, go to PayPal to add the new e-mail address to your account. Commit to buying the item you want on eBay. You have 10 days to complete the purchase. Select PayPal as the payment method and enter the voucher code by first pressing the “Select Code“ button on the payment screen. You can copy and paste the voucher code from your e-mail for this step to make sure there are no errors. The new price will be calculated and shown automatically so you can complete payment. Any outstanding balance can be paid by your PayPal account balance or using a credit or debit card. 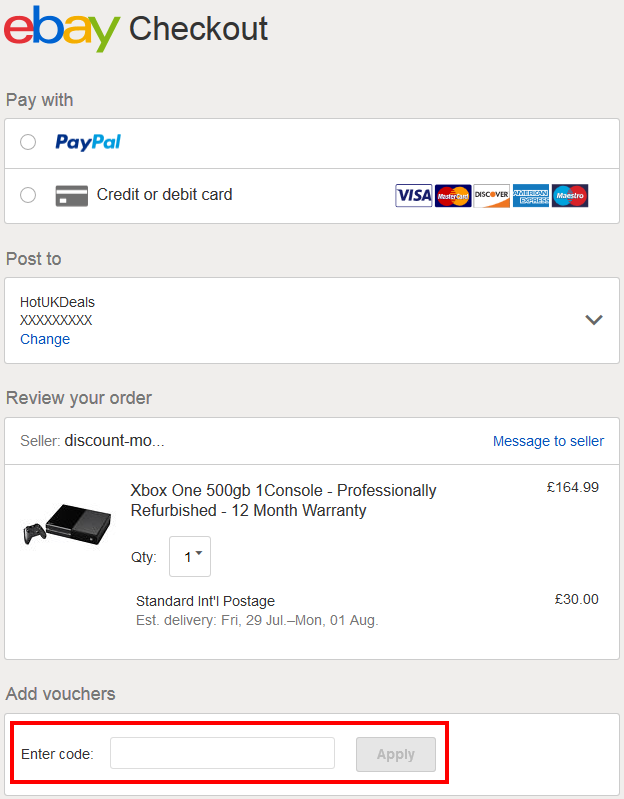 Alternatively, you can load the voucher code onto your PayPal account first before shopping on eBay. The only difference in the steps above is that the “Select Code“ button will reveal any vouchers already associated with your PayPal account so you don’t have to re-enter it to complete payment. You can also order from international eBay stores other than eBay.co.uk as long as you provide a correct address in the country of the website from which you place your order. For currently available vouchers and discount codes, visit mydealz (Germany), Dealabs (France), Pepper.nl (the Netherlands), Pepper.pl (Poland) and Preisjäger (Austria).